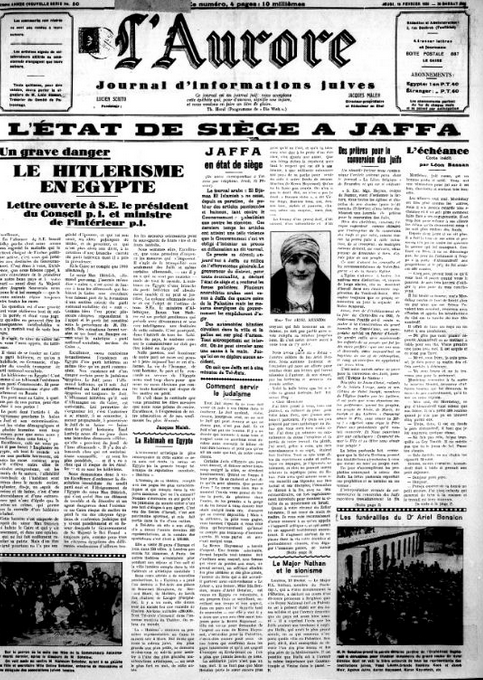 One of the most important Jewish newspapers in Egypt was L’Aurore (The Dawn). Its owner and first editor was Lucien Sciuto (Thessaloniki, 1886 – Alexandria, 1947), a writer and educator, who originally founded the paper in Constantinople, Turkey. Conflicts with leaders of the local Jewish community led to its closure, and, in 1919, Sciuto immigrated to Egypt. L’Aurore was published in Cairo from 1924 to 1941. 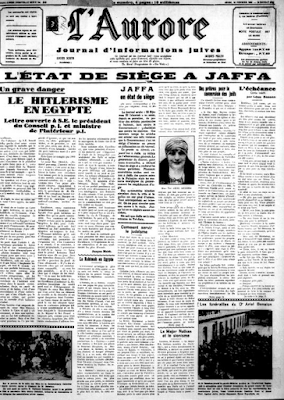 The weekly newspaper, characterized by its Zionist and Jewish affiliation, covered many areas of interest – Religious affairs, local Jewish community leaders, relations with world Jewry including the Jewish community of Mandatory Palestine and relations with the Egyptian regime. In addition, the paper published translated articles from newspapers in Mandatory Palestine and starting in 1938, it even included a page written in Italian. L’Aurore was considered a critical and provocative newspaper. It was not afraid to criticize the heads of the local Rabbinate and Jewish community in Egypt. It was also the first Jewish Egyptian newspaper to send reporters into the field, rely on sources and carry out investigative journalism to expose the reader to deficiencies in the local Jewish leadership.